The Shoals area is so blessed to have this group of incredibly knowledgeable women to help us through pregnancy and beyond! Having Jamie as my doula was one of the best decisions I made for my pregnancy and I’m not sure how my 24+ hour labor would have gone without her there! My husband felt so much more at ease with Jamie helping guide him through comforting me and I felt comforted knowing that she was helping me make sure my birth was going as closely to my desired plan as …possible. I also had Krista encapsulate my placenta to take after birth and I’m so glad I did that! I feel it really helped taper off my hormones and upped my breast milk supply too! I’m one week postpartum and already have a good stash in the freezer! When Krista dropped off my pills she was so uplifting and gave me a few tips on breastfeeding that I now realize I couldn’t have lived without! Thank you to everyone at SDG who helped us through our pregnancy and postpartum journey! The amount of knowledge and support you all provide is simply irreplaceable and I’ll forever be grateful for the experience you helped provide! I couldn’t be happier with The Shoals Doula Group! My doula, Katie, helped my whole family (husband, son, grandparents, aunts, uncles, etc.) navigate through our birth plan, changes in our birth plan, and my son’s birthday with ease and grace! She was unwavering support for me and my family. She was patient, kind, and professional. I would recommend her to anyone and everyone I know. 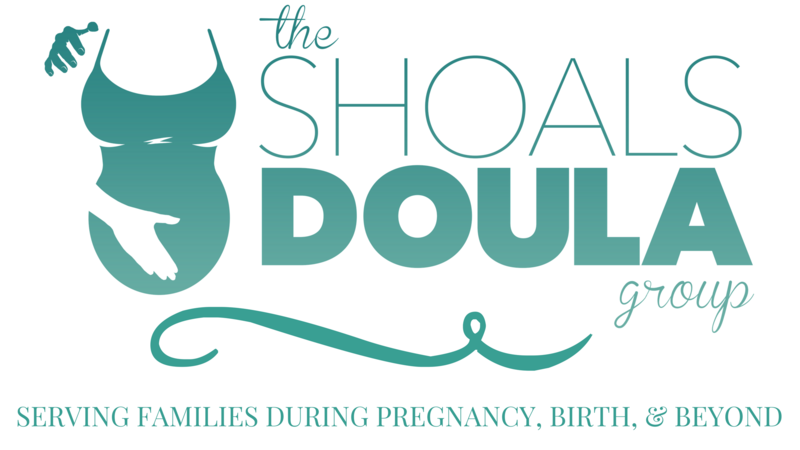 If you are looking for someone that can provide knowledge and support, look no further than The Shoals Doula Group! I really loved having Andi as my doula, she was very supportive and caring. She’s still a friend and I would highly recommend Shoals Doula Group to anyone. Jamie’s was a perfect match for my husband and I. She was always available when I needed her and checked on me frequently throughout my pregnancy. During labor she was nothing short of amazing and did whatever I needed her to do which was wonderful since I opted for an epidural free labor. Ultimately my labor lead to a C-section but Jamie was there for right there with me from start to finish, and was very reassuring when we realized a C-section was needed. I would highly recommend her and of course I will be using her in all my future births. Lindsey is such a wonderful woman! The ministry she does through being a doula is incredible! I know that it was God Ordained for her to be in there for my birth. She made such an impact in mine and my husband’s life! I can’t believe I haven’t already written this. Having Katie Terry, a super awesome doula, for our whole maternity/birthing journey was the best decision that we could have ever made. Not only did Katie have great passion, communication skills, and professionalism toward what she does, but she also became a great friend. Our little one was so stubborn to come out, yet Katie was really patient with us the whole time. We were 100% satisfied her service, therefore we definitely recommend to have Katie as your doula when you are having a baby. If I decide to give birth in Japan, I would take her (if she lets me) there! I had an amazing experience with my Shoals doula, Andi Miller Ludlam. During my two pregnancies, she provided invaluable guidance, emotional support, and physical support (best hand masseuse ever!). I wouldn’t have known about the wonders of Gentle Birth formula, spinning babies, placenta encapsulation, baby-wearing techniques, and countless other things were it not for Andi, whose knowledge is extensive. I can speak to the difference between having a doula and not having one… during active labor because, when my daughter was born, a snowstorm, combined with our accidental delay in contacting Andi, prevented her from arriving at the hospital before I received my epidural. In contrast, when my son was born this fall, Andi was by my side throughout the whole process. There is NO COMPARISON. Andi’s presence was transformative. Every one of her pain management strategies helped—from her massage techniques to her breathing instructions to her comforting conversation. She was an essential part of my son’s birth. I highly recommend Andi and the Shoals Doula Group.